which is an important cultural value for the Japanese. and this perspective applies to everyone, regardless of social status (race), gender or age. 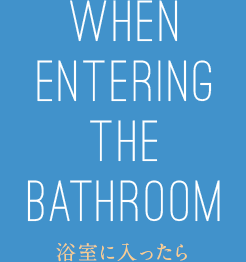 Why not master the proper way of bathing and of "reisetsu"? It certainly is a way to promote spiritual self-refinement. Despite the medically proven benefits of the onsen spring water in relieving stress and various physical symptoms, it also gives great stress to the body due to harsh stimulants. Refrain from bathing when fatigued or immediately after a meal or drinking alcoholic beverages. Please note that people wearing tattoo may not be allowed into an onsen facility. Please check the facility in advance. Allowing children to bathe by themselves is dangerous. Be sure to have an adult accompany children. Be sure to have a locker or basket to keep your clothing, including underwear, before bathing. Swimwear is not allowed. One locker or basket is allowed per person. Keep your personal belongings to a minimum, because locking may not be possible in some facilities. Remove accessories and other items to prevent corrosion. Any length of hair that touches the shoulders must be bound and kept out of the onsen water. Be sure to drink water before bathing. Be sure to have a small towel with you for use and protection in the bathroom. The onsen bath area is private space. Do not bring your camera or smartphone. The floor may be slippery. It may also be uneven or have puddles. Do not run. Walk carefully. Wash your body in space allocated for washing. Do not wash your body or shampoo your hair in space other than the designated area. Immersing things in the onsen bathtub is prohibited. Keep your belongings in a single place away from other people. For maximum enjoyment, keep conversation to a minimum and keep the volume low. In order to help your body become accustomed to onsen temperature, use a dipper available in the bathroom to pour water on your body, starting slowly from your limbs and finally to your chest and head. 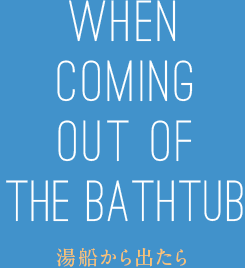 When doing this, be sure that the onsen water you are using do not get into the bathtub. Be sure to accustom yourself to the onsen water temperature, because the water temperature is high in many facilities. Never add water, even when the water is hot for you. As you get accustomed to the temperature, you will feel invigorated. 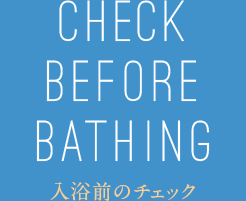 These are the rules in onsen bathing that everyone keeps to ensure enjoyable bathing for all. To keep the onsen water clean at all times, immersing towel in the water is prohibited, even when new and unused. 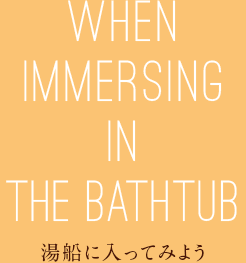 Enjoy immersing and relaxing in the onsen bathtub. Swimming or diving is prohibited, even when done quietly. Do not scrub your face or body inside the tub. The joy of onsen bathing is not limited to the spring water alone. It is a relaxing experience for all 5 senses, with the view you see from the bathtub and from the sounds inside the bathroom or from the outside. It should be relaxing and purifying experience. If you start to perspire, get out of the bathtub and have a rest. However, do not lie down along the frame of the bathtub. Be sure to drink water frequently, and refrain from bathing more than 2 or 3 times a day, to stay in good condition. Use your towel you brought into the bathroom to wipe off moisture on your body when leaving and proceeding to the changing room. It is important also not to wipe off moisture thoroughly, for long-lasting onsen benefit.